A freight train blocks the Elmore St. crossing in Crawfordsville. “Right now, we have a string to battle a giant,” says Frankfort Mayor Chris McBarnes, driving over a railroad crossing he says is frequently blocked by stopped trains. According to a state law, local governments have the authority to fine a railroad company if a crossing is blocked for more than ten minutes. So McBarnes has begun urging residents to call police, who’ve so far written three tickets. Problem is: the fines max out at $500 apiece. That’s about one one-millionth of the profits CSX made in the fourth quarter of 2017 alone – a financial slap on the wrist. McBarnes says he’s just trying to get the railroads’ attention. There’s already a case before the Indiana State Supreme Court concerning blocked crossings. The Norfolk Southern Railway Company argues the existing state statute is preempted by a federal law – the Interstate Commerce Commission Termination Act, which centralizes regulation at the federal level. The court has yet to rule on the case. Roy Scott Pkwy. highway-rail crossing in Frankfort. The intersection is located near a Norfolk Southern rail yard. Meanwhile, residents of many Indiana communities must find alternate routes around stopped trains. Charles Hart works in Crawfordsville and was on his way to the gas station after work when a train stopped and blocked an intersection along his route. He says he used to be stopped three or four times a week. Those stoppages cause traffic to become so congested that Crawfordsville Mayor Todd Barton set up a camera at the intersection that livestreams to his office. But that’s not the only problem. Driving around Crawfordsville, Barton says highway-rail crossings are also in disrepair. Crawfordsville Mayor Todd Barton points to a livestream in his office of a highway-rail crossing. The mayors say the state isn’t doing enough and the railroads are bullies. The freight companies contest the fines, which keeps crossings blocked and in disrepair – two problems local government doesn’t have the money to fix. The railroad companies, on the other hand, claim any more regulation would hurt business for everyone. 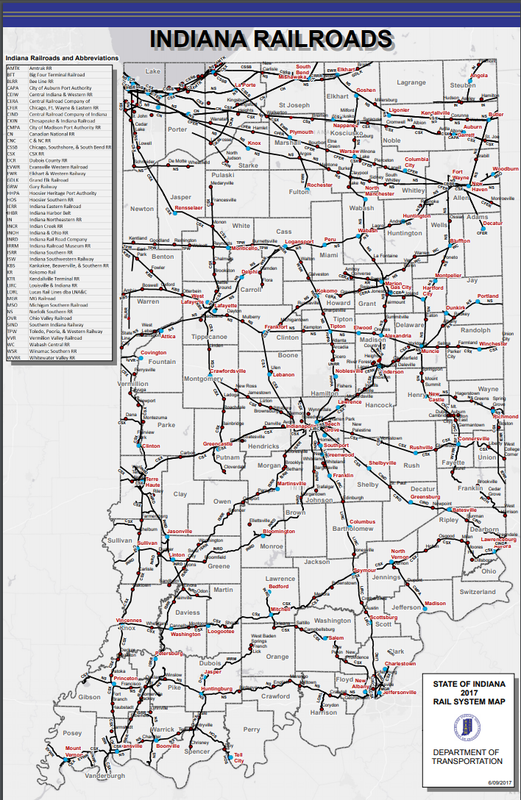 The Indiana Department of Transportation’s response is the Local Trax program. It’s a matching grant program written into last year’s multi-billion-dollar highway tax bill which gives INDOT money to front up to 80-percent of the cost of improving safety at a highway-rail intersection. INDOT spokesman Scott Manning says it’s the first step of a long-term solution to reduce the number of problematic, at-grade crossings around the state. The other 20-percent of the funding would come from local governments. Host railroads have the option to partner with municipalities to cover that cost. CSX and Norfolk Southern officials both declined a taped interview for this story. In an emailed statement, CSX says it supports the Local Trax program. And as for the blocked crossings, the company says it has experienced what it calls “operational challenges” in Crawfordsville and has since made changes to reduce the number of incidents. Company officials say they apologize to residents and are communicating with local leaders about the problem.